I wanted to write a short post to recap a great day……an emotional day but a great one. In the scheme of what is going on in the world, this certainly is not news worthy but it does reiterate what I sing from the rafters…..that blessings come out of the worst of times. 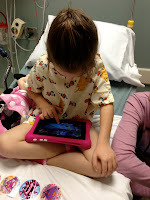 Today my 4 year old, Princess Thalia, had surgery to remove her tonsils and adenoids. It really is a routine surgery but given our past, my wife and I were a little on edge about our daughter being put to sleep and the even harder part about waiting for her to wake up. Nine and a half years ago, Thalia's older sister never woke up. That horrible day defined me and made me strong and led me to great things but I do not want to be defined again. I know I would survive. I know I would lift myself back up. I just do not want another day like that again. Anyway, since Thalia was a baby, she sounded like an 80 year old man while sleeping. This was cute and funny at first. I took video to use against her at her wedding just to capture the moments. After a while though, it kicks in that this is not how a precious little child should sound. After a while you realize that despite the huge smile on your child’s face when she wakes up (Thalia wears a smile all day long….it lights up the world)………..she is tired. After a while you notice your child is sick much more often than other kids. After a while, especially given the sensitivity tied to the past, you notice that your child stops breathing every now and then at night. Sleep apnea is a very stressful thing. Watching your child literally stop breathing will haunt your dreams and keep you from sleeping. All of these things led us on a path to figure out the problem. Enlarged tonsils and adenoids were the culprit. 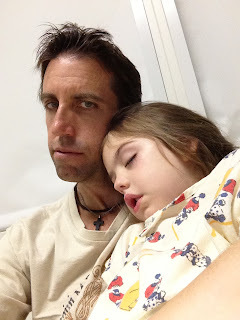 We went from pediatrician to UCLA to scheduling surgery in a short amount of time. All doctors seemed to agree that this is what made sense and, as all parents do, we wanted the best for our child. ·We had made the decision not to tell Thalia too much about what was going to happen. At 4, she would not understand any of it and we felt too much knowledge would stress her out. What she knew was that she was going to be able to watch movies and eat popsicles and eat ice cream for 2 weeks after it was over. That made her happy. ·We arrived at UCLA at 10:30am. My wife and I were very nervous but we hid all of that and just showed our little one a good time. 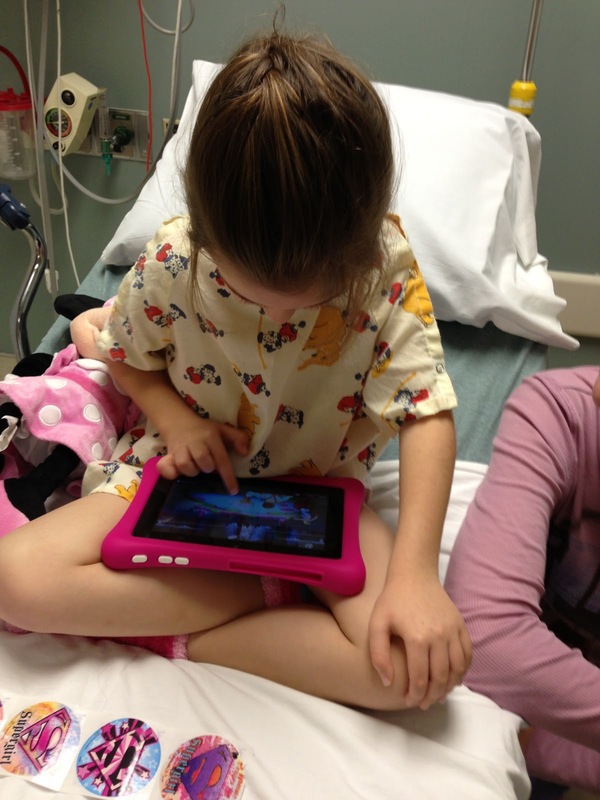 From the time we arrived to register for surgery until the time the anesthesiologist arrived, we played games and colored and laughed. Inside, my stomach was in knots but it is easy to set that aside and be strong for your child. I guess we do that for any loved one that is in a similar situation. I remember doing the same when my Dad was sick. In front of him I was confident that everything would work out but I would escape to solitude to shed my tears and deal with my fears that he was not going to make it. 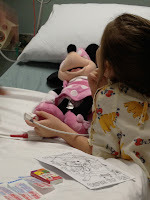 ·Around 11am, we went back into pre-op and this is where for a brief moment we could see Thalia get nervous. She watched people being wheeled by on gurney’s and it was easy to read her mind..... “what the hell are they doing to me? Ice cream cannot be worth all of this”. We quickly distracted her. Some nurses came in and dropped off a little princess sized gown for Thalia to wear. Our little one was being as cute as ever and the staff were all falling in love with her. ·Games continued with Crea and I each taking turns. When the surgeon came by I took on the task of distracting Thalia so that she did not hear all of the conversation about what was really going down. ·Next the anesthesiologist arrived and explained even more. They were all experienced in dealing with kids and did an amazing job. Thalia’s toughest choice was figuring out what flavor she wanted the gas to be that was going to make her go to sleep or which stickers and Hello Kitty Band-Aids she wanted as rewards for all she was getting ready to go thru. ·Next it was time for surgery. Only one of the parents could go with Thalia as she fell asleep so Crea took that shift. Truthfully, Crea is the stronger one for these things so she put on her own gown and off they went……Thalia still all smiles. ·Literally 2 minutes later Crea came back as Thalia had already fallen asleep. 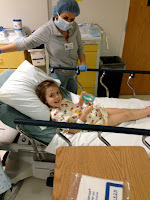 Apparently she got grumpy and tried to fight with the mask at the last second but the medicine did its thing……..off to the waiting room for us. ·Crea and I passed the time with Facebook and Twitter and conversation meant to distract us from the time. One hour. That is how long the surgery should last. 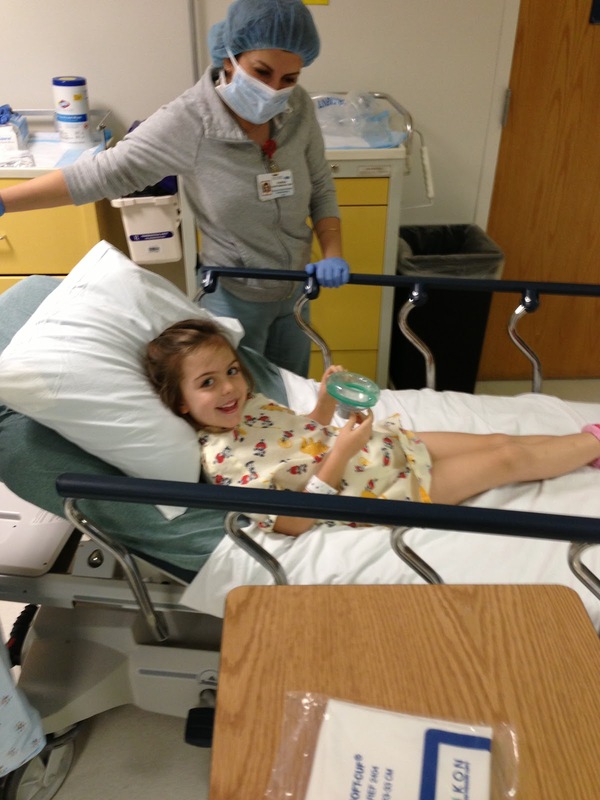 If dog years are 6 to 1…….your 4 year old daughter in surgery is 100 to 1. It felt like forever and Crea even posted to Twitter that this was the longest hour of her life. When the clock struck one hour, I started pacing outside the door and many times thought of calling the number posted on every wall to check on our little girl. 2 minutes late, 3 minutes late………I remember this feeling the first time Crea went to surgery for her cancer. Things went much slower than planned and I was a mess. This was no different and my mind raced to all of the horrible things that could go wrong. 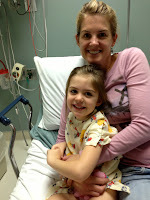 Finally, though, the surgeon came out and her smile alerted us that all was well. Thalia was just waking up and we could go back to see her. ·I really do not think we needed directions to our little princess. We could hear her crying and raced to her side. She was a mess and not happy at all. She went to sleep with a smile and woke up to an IV and pain. She was scared and it was gut wrenching to see her so upset. We did everything we could to comfort her. I told her it was all over and I promised that Mommy and Daddy would not leave her side again. Nothing seemed to be working. She was very fidgety and we could not tell what was wrong. The doctor gave her some medicine to try and comfort her and also asked her if she wanted to be held and this is where the blessings hit home. I was the lucky one that got to hold Thalia in her time of need. The nurse unraveled all of the cords covering her and brought her over to a chair where Thalia folded into my arms. The world instantly felt right.......for her and for me. She laid her head on my shoulder and within minutes had stopped crying and was asleep. It is tough to describe that level of love and that level of joy. I have tried to explain it to folks that are not parents yet but it cannot be taught......it can only be felt. All the fear of the day was gone for both of us. Holding my little girl. Watching her instantly feel better. Feeling her breathing on my chest. I would not trade that feeling for anything. Thalia is a gift from heaven. I know much of that is a Father's biased opinion but she lights up a room and she lights up my heart. There is something angelic about her and none of that would exist if Isabella had not passed away. Crea and I were going to have two children. Isabella and Jaden would be the two but God had a different plan. The hardest day of my life led to this little girl I held in my arms today.....this little girl that I could not imagine life without. Thanks for reading. I hope you can focus on what you have and the blessings around you instead of what you do not have and the hardships that face your life. We are meant to be challenged. Life is not always kind but I do believe that blessings come from out of the darkness. Today, I was reminded of mine. I had two miscarriages before I had Gabby, and every single day I feel the same way. We regularly have to deal with the anesthesia, and it just never gets easier to watch. So glad everything went well!